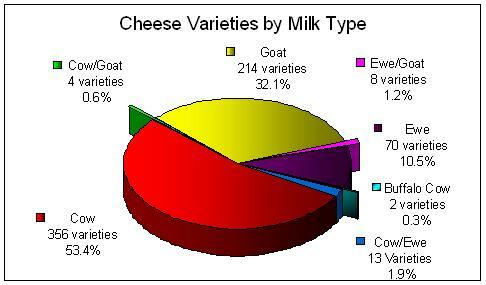 Varieties of Canadian cheese tallied by Canadian Dairy Information Center at the first link cited below. The body of knowledge on cheese that’s stored on the Web is considerable but much of it is stale and a lot of it a disguised sales pitch. Thankfully, there are excellent sites to consult on your voyage through the world of cheese—especially Canadian cheese. A great place to start is the Canadian Dairy Information Centre, a unique Internet reference for up-to-date statistics and market information on the Canadian dairy industry. It features a comprehensive Canadian cheese directory that at last look listed 667 distinct varieties of cheese, covering cow- as well as sheep-, goat- and buffalo-milk cheese. The excellent All You Need Is Cheese site hosted by Dairy Farmers of Canada has loads of information about cow’s milk cheese, recipes, pairing and nutrition. Another excellent site is Cheese Culture authored by cheese and wine expert Julia Rogers. Her Night School for Cheese Fans has been lauded by Toronto Life magazine as the best cheese class in Toronto. Check out the bite-sized reviews in Wedge Issue, her free newsletter available for download here. Speaking of education in the evening, the Tasting Soirées at A Taste of Quebec in Toronto are informative and entertaining. Artisan Cheese Marketing founded by cheese expert Kathy Guidi was the first business in Canada to recognize the demand for professional cheese appreciation classes. In response, the company developed the Cheese Education Guild in 2005, the first institution in Canada to offer a certificate-level cheese education course. To earn a Cheese Education Guild certificate, students must complete three 24-hour appreciation courses. The courses aim to develop students’ tasting and sensing abilities while building cheese vocabulary and knowledge. Cheese Appreciation courses 1 and 2 each cost $550, while the final Cheese Appreciation 3 costs $620. Information on upcoming courses is listed on the company website, and can also be obtained by emailing Artisan Cheese Marketing. The new and indispensable Canada Cheese: A Pocket Guide was authored by Kathy Guidi. The Invest In Cheese people have come up with a great resource, a cheese news aggregator. If you’re thinking of become a cheesemaker in Ontario, your first step should be to read every word on the Invest In Cheese site. Then go live your dream. Another excellent albeit commercial site is AboutCheese.ca, sponsored by Cole Snell’s Provincial Fine Foods, the leading distributor of Canadian artisan cheese. He operates a retail store in Toronto as well. Gurth Pretty wrote The Definitive Guide to Canadian Artisanal and Fine Cheese, a most comprehensive work that deserves a place in every cheese lover’s home, but his website, Cheese of Canada, is light on lore. Heavy on cheese lore with a scientific bent is the excellent site authored by Professor Arthur Hill of the Department of Food Science, University of Guelph. From acidification and coagulation to whey processing, it’s all here. Dr. Hill runs a five-day hands-on course at the university every spring. An informative series of articles on Canadian cheese appears in The Globe and Mail every other week. The articles by Sue Riedl are so expertly crafted you can almost taste the cheese as you read. California’s Cowgirl Creamery has created a comprehensive online Library of Cheese but no Canadian cheeses are covered. More recommended websites to follow. You can submit your candidates by leaving a reply below.